Produced by Nuclear Africa (Pty) Ltd for general public information. E=mc2 This equation shows that energy produced ( E ) from some mass of anything ( m ) is equal to the mass, multiplied by the speed of light ( c ) squared. The speed of light is a very large number, so the energy that this equation predicted would result from a small mass, would be enormous. Most people just did not believe it, and the young Einstein was mostly criticised and treated with distain. 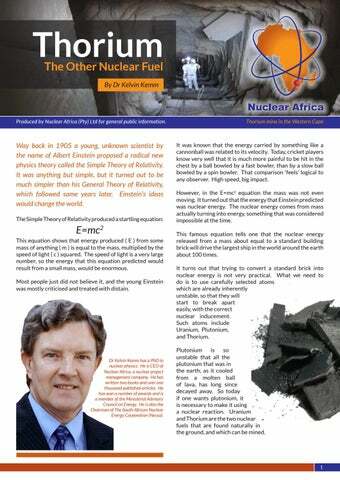 Dr Kelvin Kemm has a PhD in nuclear physics. He is CEO of Nuclear Africa, a nuclear project management company. 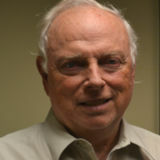 He has written two books and over one thousand published articles. He has won a number of awards and is a member of the Ministerial Advisory Council on Energy. He is also the Chairman of The South African Nuclear Energy Corporation (Necsa). It was known that the energy carried by something like a cannonball was related to its velocity. Today, cricket players know very well that it is much more painful to be hit in the chest by a ball bowled by a fast bowler, than by a slow ball bowled by a spin bowler. That comparison ‘feels’ logical to any observer. High speed, big impact. However, in the E=mc2 equation the mass was not even moving. It turned out that the energy that Einstein predicted was nuclear energy. The nuclear energy comes from mass actually turning into energy, something that was considered impossible at the time. This famous equation tells one that the nuclear energy released from a mass about equal to a standard building brick will drive the largest ship in the world around the earth about 100 times. It turns out that trying to convert a standard brick into nuclear energy is not very practical. What we need to do is to use carefully selected atoms which are already inherently unstable, so that they will start to break apart easily, with the correct nuclear inducement. Such atoms include Uranium, Plutonium, and Thorium. Plutonium is so unstable that all the plutonium that was in the earth, as it cooled from a molten ball of lava, has long since decayed away. So today if one wants plutonium, it is necessary to make it using a nuclear reaction. Uranium and Thorium are the two nuclear fuels that are found naturally in the ground, and which can be mined. South Africa possesses the world’s richest thorium mine, Steenkampskraal in the Western Cape. It is approximately 350km north of Cape Town. The mine was discovered in the late 1940s and produces valuable Rare Earth materials, plus thorium. Small quantities of Rare Earths are used to make items like super strong magnets which are used in cellphones. Steenkampskraal is owned by STL (Pty) Ltd, a Centurionbased company near Pretoria, in South Africa. STL is working on processing the thorium to nuclear grade purity. Fuel Assemblies Thorium can be placed into High Temperature Gas Reactor (HTGR) fuel such as the South African fabricated fuel ball shown in the picture, but can also be placed into conventional metal fuel reactor assemblies, with very little modification required. Experimental work is currently underway internationally, testing thorium fuel in various configurations. Most Smaller Modular Reactor (SMR) systems are formed from HTGRs. How does a thorium reactor work? Well, like this: Thorium-232 is mined from the ground where it is extracted from one of its naturally occurring minerals, such as monzonite. This Thorium-232 is later placed in a nuclear reactor, usually in the form of thorium dioxide ThO2. At this point the thorium atoms are referred to as ‘fertile’ atoms, their nuclei will not split. Then one has to arrange to bombard these fertile thorium nuclei with a stream of neutrons. The neutrons can come from various sources, such as Plutonium or U-235. A neutron from such a source penetrates a Th-232 nucleus, where it is captured, turning the nucleus into a Th-233 isotope. This isotope is unstable and a nuclear decay reaction takes place and it turns into another element Protactinium-233. Another nuclear decay soon occurs and this Pa-233 transmutes into U-233. Another neutron then strikes the U-233 which fissions like the U-235 in a conventional uranium fuelled reactor. Energy is released and more neutrons are produced which keep the whole chain reaction going. Thorium - An Abundant Nuclear Fuel World electricity consumption doubled in approximately the past 25 years. There is every reason to believe that it will double again in the next 25 years, if not sooner. One only has to look at the low electrification figure for many African countries, to receive a psychological jolt. Many African countries are only 5 or 10% electrified. It is well known that one of the fastest economic accelerators which can be used to improve the living conditions of low socio-economic societies is to provide an inexpensive, reliable, electricity supply. Such an energy supply almost instantly brings with it the development of schools, clinics, communications, adult education, food preservation, lighting and much more. Commercial nuclear power has been in operation for more than half a century and has shown itself to be the safest form of electricity production. It is clean and reliable. In the public mind, nuclear power is viewed as being composed of large plants run by sophisticated First World countries. This image is largely true, but considerable research and development being carried out right now is set to change this view. Thorium Properties Thorium was discovered by Jöns Jacob Berzelius, a Swedish chemist, in 1828. He discovered it in a sample of a mineral that was given to him by the Reverend Has Morten Thrane Esmark, who suspected that it contained an unknown substance. Esmark’s mineral is now known as thorite (ThSiO4). When it is pure, thorium is a silvery white metal which is air-stable and retains its lustre for several months. When it is exposed to air, thorium slowly oxidises and tarnishes, becoming grey and finally black. Thorium oxide has a melting point of 3300°C, which is the highest of all oxides. Only a few elements such as tungsten, and a few compounds such as tantalum carbide, have higher melting points. Reactors known as SMRs or Small Modular Reactors are under development, and are close to deployment. They are only 5% to 10% the size of the current large reactors and are ideally suited for large-scale deployment in developing countries. For that matter, in First World countries as well, where they can be strategically positioned near to areas of high electricity demand. SMRs do not need large volumes of water for cooling, so they don’t have to be built on large bodies of water, like oceans or large lakes. So SMRs can be placed wherever you like. As far as the existing large reactors are concerned, there are currently some 440 in operation around the world, with about another 70 under construction. So the visible market which can be internationally penetrated for nuclear reactor fuel sales is approximately some 500 nuclear reactors. Thorium is named afterThor, the ancient Norse god of war. Isotopes For now let us consider that the nucleus of an atom consists of neutrons and protons. They are about the same size and mass, but the proton is positively charged and the neutron is electrically neutral. In fact many other particles can come out of an atomic nucleus at times, like beta particles, muons, and more, but that is higher level nuclear physics and we will ignore those complex details for this discussion. The number of protons in a nucleus determines what the material is. For example carbon has 6 protons, oxygen 8, gold 79 and uranium 92. If you also then add the neutrons to the nucleus, this then gives the total mass of the element. (In shopping centre jargon ‘the weight’, but we don’t use ‘weight’ in this context in physics.) Adding the neutrons to a carbon nucleus gives a typical mass of 12, whereas uranium comes out at 238. However the number of neutrons in a nucleus is not necessarily fixed at an exact number and it can vary a bit, so some carbon atoms can have two additional neutrons, to be carbon-14 and uranium can have a few less to be uranium-235 or uranium-233. All isotopes chemically react the same way, so carbon-12 and carbon-14 both form charcoal and burn exactly the same way, when oxygen is present. Scientists did not know that isotopes existed until the atomic age was underway and then this tiny mass difference was detected, and explained. For virtually all scientific applications in our daily life, the existence of isotopes makes no difference. However one important attribute of the differing numbers of neutrons in a nucleus, is that this determines how tightly bound the nucleus is. This is like the amount of ‘glue,’ so a U-238 nucleus is more tightly ‘glued’ than a U-235 nucleus. In physics this is known as the Binding Energy. This means that it is easier to split a U-235 nucleus in a nuclear reactor, so releasing its nuclear energy. A U-233 nucleus also splits easily, but you don’t find U-233 in nature, you have to specially make it, by using thorium. However there is a thorium isotope which does exist naturally in the ground, and it is very close to what we are looking for, it is Thorium-232. But it will not split in a nuclear reactor, because the packing arrangement of 232 particles is more strongly bound (more binding energy) than the packing arrangement of 233 particles. So we have to make a plan to change the 232 atom into a 233. (See page 2: Fissile and Fertile) This sponsor has kindly made the production and publication of this brochure possible. Research into using thorium in nuclear reactors was carried out in the United States in the late 1950s and also in Germany and the United Kingdom in the early to mid-1960s. In the US, several demonstrations of the use of thorium reactors were performed. In Germany and the UK, thorium was used in their early demonstration High Temperature Gas Reactors (HTGR) such as the AVR and THTR reactors in Germany, and DRAGON in the UK. Most of the thorium used in all of these reactors came from the Steenkampskraal mine.